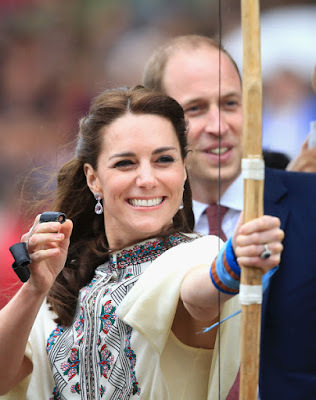 If, like me, you've caught any news this week, you'll have found it hard to miss Kate's regular appearances. And like me, you may have also found it hard to turn your attention away from her amazing array of colourful & beautifully detailed dresses. 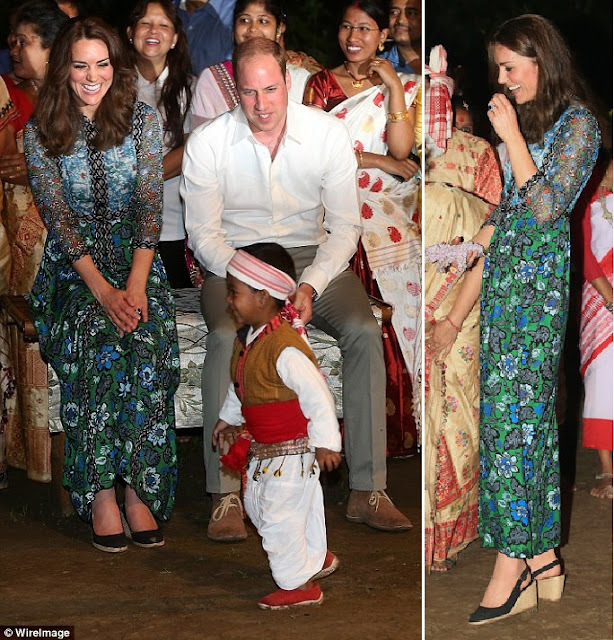 Whether it is the designer within me noticing the beautiful craftsmanship of these garments, or perhaps just their eye-catching prints, I feel the need to share with you Kate's celebration of Eastern meets Western style on her 2016 tour of India & Bhutan. 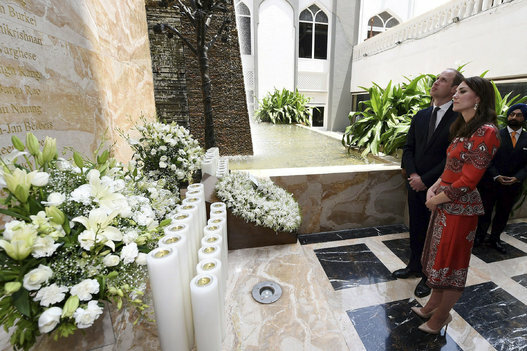 Upon arrival to India, wearing an Alexander McQueen silk peplum outfit from the PreFall 2016 collection, Kate pays respect at the Taj Hotel in Mumbai. 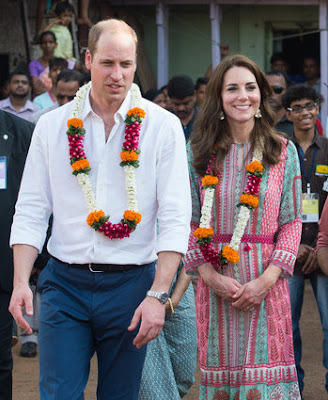 In a dress by Indian designer Anita Dongre, Kate & Will visit the Oval Maidan recreation ground to meet children from three non-governmental organisations, for an afternoon of sport. Wearing British designer Jenny Packham's beaded sapphire gown for a Bollywood inspired Charity Gala at the Taj Mahal Palace Hotel on their first night in Mumbai. 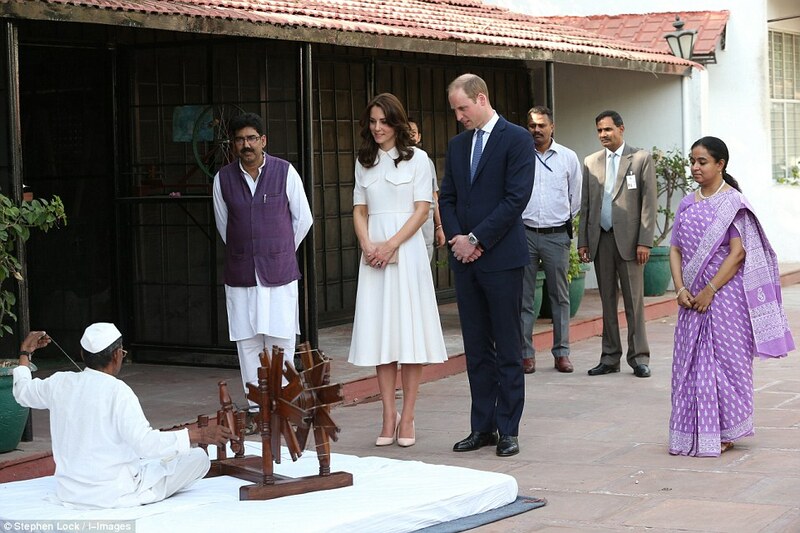 Visiting the Gandhi Smriti museum in Old Birla House, New Dehli, in a luxuriously floaty Emilia Wickstead white dress. Attending a garden party in honour of the Queen's 90th birthday in New Dehli, in a Temperley London monocromatic ebroidered crop top & maxi skirt. Attending a meeting with India's Prime Minister Narenda Modi in New Dehli, in a bespoke altered turquoise Alice Temperly crochet lace dress. Look at all that detail & attention to cut - beautiful! 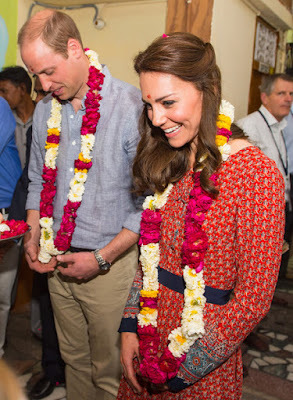 Greeted with garlands, complimenting Kate's ditsy printed red maxi dress, at a contact centre run by charity Salaam Baalak - which provides emergency & long term help for homeless children in New Delhi. Day 3 at Kaziranga National Park, watching dancers celebrate the Bihu Festival. 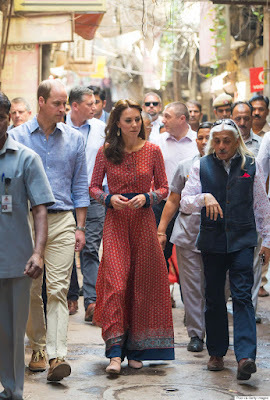 Kate wearing a floral silk chiffon maxi dress, with an embroidered trim, by Anna Sui. 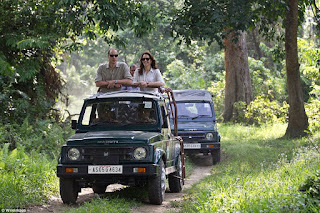 The couple visit the Kaziranga National Park in Guwahati, home to some of the countries most endangered animals. 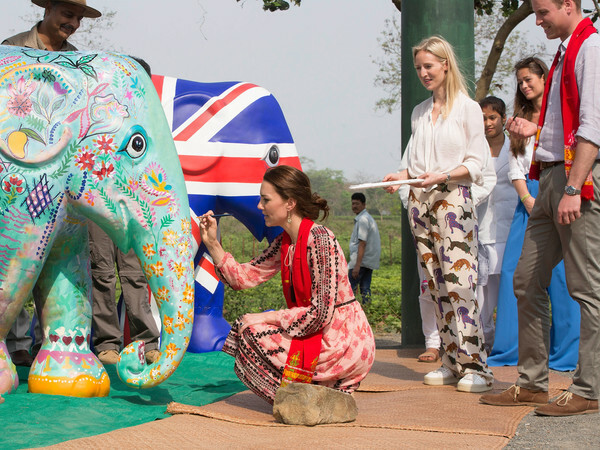 The couple's visit to the Mark Shand Foundation in Kaziranga National Park, to address a cause close to their hearts - the care of endangered animals. Kate wears a delicate floral pink dress with dainty contrasting black embroidery detail. 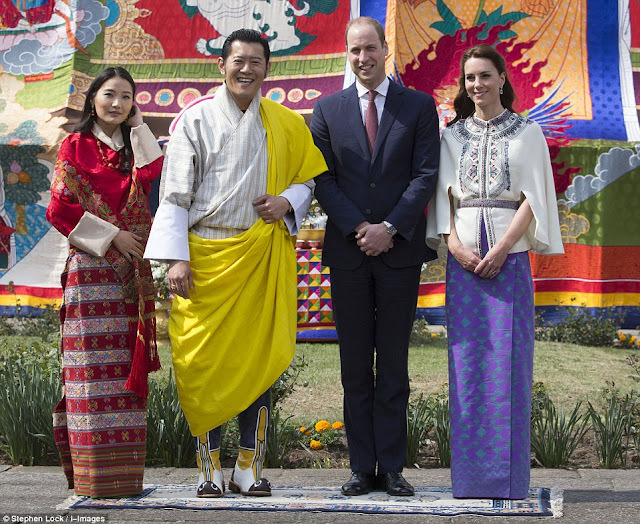 Arriving in Bhutan, the couple were greeted by the King of Bhutan's sister Chhimi Yangzom & her husband. 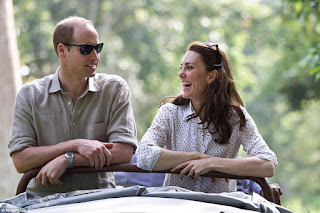 Kate wore a pale gold coat dress by Emilia Wickstead. The couple try their hand at the Bhutanese tradition of archery in Paro, Bhutan. Kate wears an embroidered cape by Paul & Joe, along with a skirt woven by Bhutanese weaver Kelzan Wangmo & sewn back in London, while being hosted by the King & Queen of Bhutan. Now let's take a moment to celebrate the Himalayan's answer to Will & Kate - Queen Jetsun Pema & King Jigme Khesar Namgyel Wangchuck of Bhutan - a young royal couple whose romance could have been plucked from a fairy tale. The youngest queen in the world, just 25, Jetsun Pema is much loved by the locals for her modest demeanour & natural beauty & met the King through family connections with the royals. It was love at first sight - he said that he'd been so moved by her beauty & inner goodness, that he vowed she was the only women he would ever marry, renouncing his right to take multiple wives & turning his back on the tradition of an arranged marriage. Beautiful! 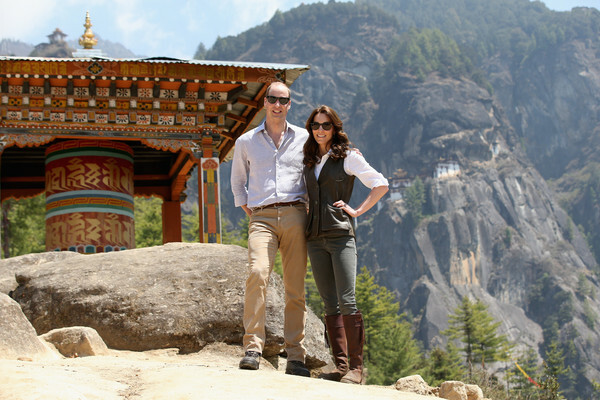 During their trek up to Tiger's Nest, the couple take in the culture & the spectacular views of Bhutan. 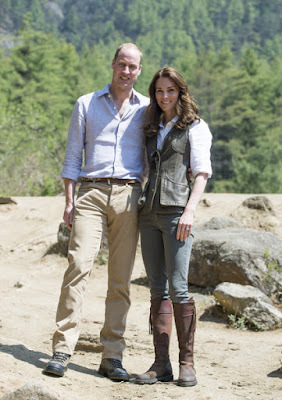 Kate wearing an English country style khaki jeans & waistcoat, with a classic white shirt. Attending a reception celebrating the friendship between the UK & Bhutan in Thimphu, Bhutan, wearing a silk chiffon bell sleeved floral red dress, with side split details. 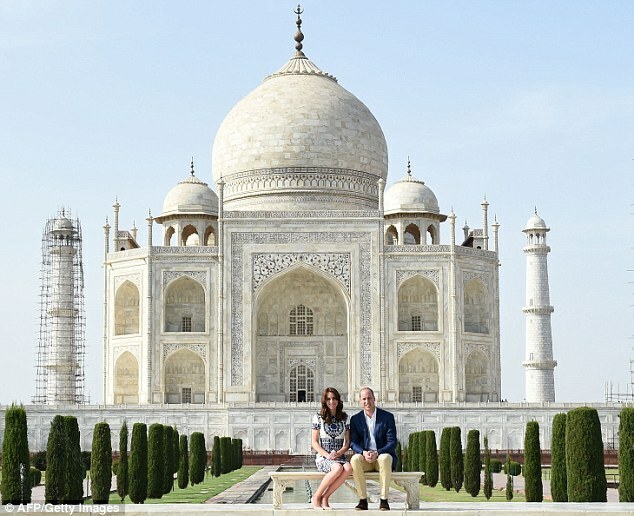 Their last engagement of their tour, a trip to the Taj Mahal - & probably the most sentimental part of the tour for Prince William, after that Iconic photograph was taken here of his mother Princess Diana. For her last style snap, Kate chose a Naeem Khan white & blue print tailored dress.